John is a nuts and bolts construction lawyer and condominium association lawyer. So you may not think he would have graduated from college with a B.A. in Philosophy (a search for the truth), with a minor in Literature (the truth through stories) but he did. He hears stories every day from clients in the construction community and condominium associations who are frustrated by a problem that needs a legal solution. Listening to the often interwoven details on construction issues, real estate matters and condominium association disputes, John is instilled with a passion particularly suited to address the problems that he helps his clients solve. After college John worked as a paralegal at Chadwell & Kayser, Ltd., a large corporate law firm in Chicago, until he entered law school. He received his law degree from Northwestern University School of Law in 1980. 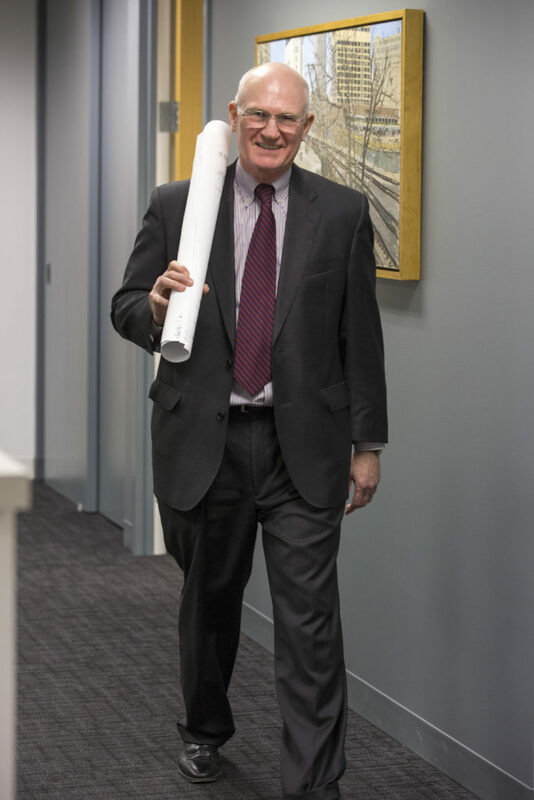 He began his law practice at a large Chicago defense firm, Rooks, Pitts & Poust, now part of Dykema Gossett, defending employers on workers compensation cases brought by employees claiming injuries on construction projects. He managed the workers compensation litigation defense for Commonwealth Edison and its contractors on Commonwealth Edison’s ambitious nuclear power plant construction program. In 1985 John joined a small Chicago trial lawyer firm where he honed his skills trying large complex technical civil cases in front of juries. While there he also studied economics and finance at the University Of Chicago Graduate School Of Business, started a condominium development company and a residential multifamily apartment business. John studied for and received a Master of Laws degree in Real Estate Law from John Marshall Law School in 1999. That year he decided to combine his knowledge and experience in the real estate management, construction and development business with his experience as a trial attorney, forming O’Leary Law Firm, LLC which serves clients in the construction industry, real estate development business and condominium associations. Every construction dispute he handles for clients has its own special story. He hears stories every day from contractors, subcontractors or building owners about issues that arise on their construction projects which require legal skills to resolve. They can be complicated stories with lots of sub plots, many different actors, surprise twists and dangerous hidden traps for the unwary. When he isn’t analyzing case claims or examining construction documents on one of his cases, you may find him hanging around the boiler room or inspecting the roof for potential leaks or masonry issues on one of his 1920’s era buildings. You might find him attending community meetings focused on topics such as how good property development, management and properly managed construction projects make a community better. For John, the real interesting stories involve construction projects. As both a developer and an owner, he is professionally and personally invested in good outcomes. John O’Leary is a member of the American Bar Association Forum on the Construction Industry, the Chicago Bar Association Mechanics Lien Committee, the Chicago Association of Subcontractors and Affiliates, The Illinois State Bar Association, and has served on the Auxiliary Board of the Chicago Architecture Foundation. He believes that good property management and responsible building is the lifeblood of vibrant, livable communities and was one of the founding directors of the Rogers Park Builders Group to promote those goals in practice. He is a speaker at Chicago Bar Association and Lorman Education Services Seminars as well as before industry groups in the construction community. John J. O’Leary is admitted to practice in Illinois and before the U.S. District Court for the Northern District of Illinois.